"Thank U, Next" (stylized in all lowercase) is a song by American singer Ariana Grande, released as the lead single from her fifth studio album of the same name (2019). The song was released on November 3, 2018, without any prior official announcement or promotion. The track was written by Grande, Tayla Parx and Victoria Monét, along with its producers Tommy Brown, Charles Anderson and Michael Foster. Lyrically, the song reflects on Grande's past relationships. 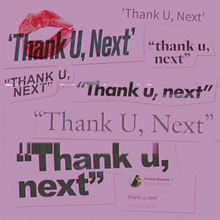 Commercially, "Thank U, Next" has reached number one in the United States, the United Kingdom, Australia, Canada, Estonia, Finland, Greece, Ireland, Lebanon, Malaysia, New Zealand, Portugal and Singapore, the top ten in Austria, Belgium, the Czech Republic, Denmark, Hungary, Iceland, the Netherlands, Norway, Slovakia, Sweden and Switzerland, and the top twenty in France and Germany. The Hannah Lux Davis-directed music video, which references Mean Girls, Bring It On, 13 Going on 30 and Legally Blonde, was released on November 30, 2018, and subsequently broke several YouTube and Vevo records. On November 2, 2018, the singer tweeted lyrics of a mysterious track, after her ex-fiancé Pete Davidson joked about their broken engagement on Saturday Night Live. The following day, Grande tweeted more lyrics, revealing that they indeed belong to a track named "Thank U, Next", which she described was lyrically and conceptually the opposite of her Dangerous Woman track "Knew Better". The singer also revealed "Thank U, Next" would serve as her fifth album's name, which she had been teasing for months on Twitter. The song was released on November 3, 2018, without any prior official announcement or promotion.